Twenty-four vehicles are each depicted on a single page with one sentence that describes what that vehicle does. 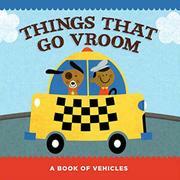 Unfortunately, very few of the vehicles in this board book actually go “vroom.” Instead, a “helicopter zooms through the sky,” and a “ferryboat carries people across a river.” While the level of detail presented is about right for very young children, the creators missed an opportunity to also describe the characteristic sound of each vehicle. Such descriptions would have made this book of motorized conveyances a satisfyingly noisy and interactive reading experience. Mack's greeting-card–cute illustrations are generic to the point of blandness. All the vehicles are driven by racially diverse figures with toylike, identical smiles. The only illustration that shows movement or speed is a view from above of race cars on a track. All the other images are shown from the side, reduced to their essential shapes. Sometimes the scenes shown on facing pages share a skyline, but the roads these vehicles travel on are not connected. On the page with a police car that “whizzes by on a high speed chase,” the car being chased is not even on the same road. The final two-page spread reviews all the vehicles shown earlier.